You can earn some stuff just by playing, at least. Update: Treyarch has overhauled Black Ops 4's new loot box system after it slid into the PS4 version of the game and nobody liked it. Perhaps we're now seeing the benefits of having to wait a bit longer to get updates on PC. Instead of needing to shell out real money for these 'reserve crates', you can once again earn 'reserve cases', loot boxes earned by playing, at every tier beyond 100. The rate at which you can earn them through playing Black Ops 4 has also been doubled. There's another significant difference between crates and cases, however. Crates net you three items, but you only get one in a case. And it's not just cosmetic items locked inside them—characters and weapons are in there, too. Even with the changes and retroactively giving players cases they would have earned, the system is still extremely off-putting, especially when combined with the season pass, battle pass and initial price of the game. You're looking at £80 just to get the base game and season pass combo, and even after dropping a fair amount of cash, you'll be encouraged to spend more. I cannot imagine spending that much money when the games it's competing with for my attention, such as Fortnite and Apex Legends, offer so much more value and have a base price of free. Operation Grand Heist, the latest update, is due out on PC this week. Original story: Call of Duty: Black Ops 4's design director, David Vonderhaar, has defended an interview where he said Blackout characters would be only be locked behind missions. 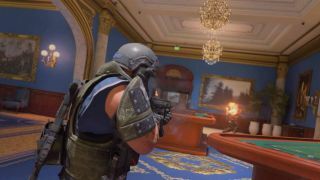 The interview resurfaced after the latest update, Operation Grand Heist, snuck loot boxes into the game and trapped the new characters inside them. It's become increasingly hard to escape Black Ops 4's microtransactions. It's a premium game with a cosmetic shop, a season pass, a battle pass and now these loot crates, called 'reserve crates' in-game. Vonderhaar said that, knowing what he knew then—the interview video was published in September 2018—that was the only answer he could give. "At the time this interview was conducted, which was previous to shipping the game, that's precisely and exactly how it worked. If I went back in time and re-did this interview, I'd have to answer it the same way I did then." He pointed out that changes occur across development, and they're not always design decisions. Specialists being unlocked through microtransactions and new characters being added via the season pass are two such examples, both of which changed after the interview. "I can tell you what we have done and what we plan on doing, but things change that I cannot predict or I didn't know about," he continued. "Doubly true with the business side of things which have little insight into and even less control over." The alternative, he said, was not giving interviews at all. "I answers the questions as best I can with the information I have at the time I am asked. If time passes and things have since changed... you could accuse me of not being clairvoyant, but a liar is someone who is purposefully trying to deceive you. That's just not the case." Black Ops 4's performance, particularly retail, did not meet the expectations of publisher Activision, which recently reported record profits and laid off hundreds of people. When Operation Grand Heist was properly unveiled just before its launch, it wasn't remotely clear that loot boxes would be the price of all the new stuff. And they're the worst kind of loot boxes: they can't be earned just by playing the game. You need to spend cash and you still might end up with poor rewards and even duplicates. Because of an exclusivity deal with Sony, PC players have yet to open any of these loot crates. Operation Grand Heist launched on PS4 on Wednesday, but everyone else will have to wait until next week.